There are several haunted places of Colonial Williamsburg. Williamsburg is a village that has been restored to replicate the original 18th century activity that occurred in the area. One of the haunted places in colonial Williamsburg is said to be the Payton Randolph House.There are several accounts of hauntings at the Peyton Randolph House. The first haunting is that of a young soldier who stayed in the structure when the Peachy family owned it. At the time of his stay, he attended college to advance in his studies. Unfortunately, he fell ill. When this occurred, he was cared for the best that he could be, but he eventually died because of the devastating illness. Today, several accounts attest to the fact that the spirit of the young man still lingers in the structure. Many have stated that they have seen the apparition of a male, while others have stated that they have heard footsteps that seem to be quite heavy. There are many different spirits that are rumored to be in the Peyton Randolph House. Hauntings are believed to be in the twenties. One account is of a friendly, older woman who is dressed in a white, flowing gown. Then, there is what appears to be a young girl who is believed to have died as a result of a fall down the stairs. The Peyton Randolph House is one of the oldest structures in all of Colonial Williamsburg, which means it is quite likely that many of the cases of hauntings are true. The Ludwell-Paradise House is said to be haunted by a woman by the name of Lucy Ludwell. Several individuals have stayed at this home throughout the years, and most of them state that they hear what sounds to be a woman who is bathing in the upstairs bathroom. When individuals inspect the room, they are able to see that it is completely empty. History states that this lady used to take numerous baths a day in the same bathroom where the sounds are emerging from. It is believed that Lucy Ludwell’s spirit remains in the home, or that so much energy was given off in this room that a residual haunting is occurring. Hangman’s Road is a road that sets just off from Colonial Road, outside of the area of main Colonial Williamsburg. History has it that after the infamous pirate, Blackbeard, was beheaded, quite a few of his pirate ensemble still existed. In the year of 1719, approximately fourteen were hung along this road. Today, there are several accounts of unusual sounds that cannot be explained. The most common sounds resemble that of an old wooden wagon traveling down the street. In addition to this, it is not uncommon for someone to reflect on sounds that feel close, yet sound distant. These sounds are “eerie” according to witnesses. 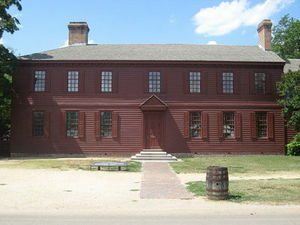 The Wythe House was built as a gift to George Wythe as a gift from his father in law. This occurred in the year of 1755. Much later, a new owner took over the establishment by the name of Ann Skipwith and her husband, Sir Peyton Skipwith. The story goes that Ann actually took her own life in the area of the bedroom that she shared with her husband. Individuals have accounted to the fact that they have heard what appears to be the sound of a woman in heels running upon the stairs in the home. In addition to this, several have claimed that they see the ghost of a woman. The spirit seems to linger in the area of the stairs, as well as that of the bedroom of the home. It is believed that this is Ann Skipwith. One of the other haunted places in Colonial Williamsburg is said to be the Nicholson House which once served as a home to a great violin player by the name of Cuthbert Ogle. This was in the 1700s. Originally constructed by Robert Nicholson, Cuthbert Ogle fell in love with the structure once it came up for sale. He resided in the home until his death in the year of 1755. Today, many claim that the spirit of Ogle still resides in the home. Many have attested to the fact that they have been touched by an unseen presence in a non-intrusive manner – mostly in the area of the shoulders. Then, there are many who hear loud sounds that resemble that of scratching late at night. The College of William and Mary appears to house several spirits who are enjoying everything but rest in the afterlife. A soldier who fought in the Revolutionary War met his death in a small room that is to the back of the college due to a gunshot injury he received while fighting. This occurred on the third floor of the college. Several students and individuals who work at the school have claimed that they have seen a soldier in spirit form walking in a mist-like state around the area where he reportedly passed. There are several areas around this college that appear to have hauntings. One such place is the building that is named “Brafferton”. It was in this building, which several tribes of boys that were Indian were sent to learn behaviors and beliefs that surround the Christian faith. When the boys arrived for rehabilitation, several of them were lacking in nutrition and fell ill. They were not at all happy with being separated from their tribes, and attempted to escape several times. Unfortunately, for many it was too late and they ended up dying. It is believed that these spirits still roam the building, trying to escape. There are many hauntings that seem to be tied to Colonial Williamsburg. If you are seeking haunted places to go, this living museum of rich American history is sure to be pleasing on your adventures in ghost hunting, so visit Colonial Williamsburg today! Check for directions, hotels, attractions, view photos, and read the reviews and traveler tips for the Williamsburg, Virginia! There are several different ghost tours offered here that point out the haunted places and stories behind them.